Although rooms of a smaller proportion are often disregarded and used as a place to hoard old belongings, they can in fact be transformed into a spacious, wonderfully decorated room. There are no limitations on the uses of a smaller room, whether this may be a spare bedroom, playroom or even a ‘quiet room’ ideal for relaxing at the end of a long, busy day. It may take a little hard work and many tedious tasks, but you’ll be able to create the perfect space in no time. If you’re hoping to renovate your home and beginning with the smallest room in your property, or, are fed up of wasting the valuable space, we’ve devised a guide to small room interior design ideas; all of which are promised to maximise space. There are tonnes of different super handy tips and tricks that are ideal for creating the illusion of a larger space, while still injecting some personality into the room. Luckily, you do not have to spend a fortune on replacing all furniture and building extensions to maximise the space you have and enjoy the time you spend in it. Starting with the foundations of the room, all the way to the useful, space-saving finishing touches, our ten interior designs are perfect for bringing some well-needed inspiration into the decorating process. While a darker colour will bring depth into a room, it unfortunately, is not the most practical of colour schemes to opt for when decorating a small room. Not only will it make the room look busy before even adding any furniture, but it will also enclose the space further, making it seem increasingly boxed in. With this in mind, we suggest beginning your renovation with repainting the room using only bright, clean and neutral colours. Keeping the foundations of the room as basic in colour as possible will absorb the natural light, as opposed to reflecting it, therefore, creating a more airy and spacious feel. Another fantastic benefit to maintaining a neutral palette means that you are free to change your colour scheme as often as you see fit. You could begin with, for example, a yellow colourway during the Summer by using colourful finishing touches. You could then decide you’d prefer a red, festive feel over the Christmas period, meaning all you will need to do is replace decorations and ornaments. In a small room, every inch counts and the more you can save through handy hacks, the better. Particularly when decorating a small bedroom, it can be tricky to fit in all of the necessities such as a bed, clothing storage and enough space to move with ease, without looking too busy and cluttered. A top tip that many do not consider is to ditch fitting a headboard altogether and to stick with just the bed frame itself. This will allow the bed to sit flush against the wall and allow more floor space; even the smallest of extra space can make a world of difference! We love the range of bed frames from Wayfair! If you’re worried about the idea of the bed being a little uncomfortable without a headboard, then not to worry – why not invest in large decorative cushions to prop against the head of the bed, so you can still sit comfortably? A variety of retailers, such as Dunelm and Zara Home stock a collection of stunning cushions, ideal for any decor theme! One of the best ways to enhance your space is to magnify the room by fitting large statement mirrors. If you are able to, strategically placing the mirror cleverly opposite a window will reflect the natural light around the room creating the illusion of more space. The type of mirrors you opt for, of course, is dependant on the room type. Those who are redecorating a bedroom would be best suited to a full-length mirror as it will allow you to see full outfits while getting ready. On the other hand, large square mirrors would be perfect for a living room as they can, for example, be incorporated into the mantlepiece or above furniture. For a vast range of different mirrors suited to every room type, head over to Mirror Outlet. You would be surprised at the amount of wasted space that could cleverly be transformed into an excellent storage solution; all of which are hidden away, making cleaning a straightforward task. If you have a small bedroom, living room or even kitchen and bathroom, then you would know the struggle of trying to store away all of your belongings neatly, without making the space appear too cluttered. Hidden storage is perfect for ensuring that every nook and cranny of your room is being put to good use. The largest pieces of furniture are the best places to utilise hidden storage as underneath and on the sides are often empty areas. In a bedroom, under the bed is ideal for storing old clothes that are out of season – for example, coats, jackets and boots during the Summer and then holiday essentials during the Winter. Depending on where your bed is located, you could opt for a lift-up bed or drawers around the circumference of the frame. Even in the bathroom, the inside of the bath panels can be fitted with small shelves to store cleaning products. Multi-functional furniture is an absolute lifesaver when it comes to smaller rooms. Why use up valuable space with multiple pieces of furniture when you can kill two birds with one stone and fulfil all of your needs just with one? One of the best rooms to utilise multiple-use furniture is the living room. The living room is the heart of the home, it is where you socialise, relax and unwind as a family at the end of the day, so it is imperative for there to be plenty of free space. Although upgrading your sofa to a sofa bed is often the only multiple-use furniture idea homeowners consider, don’t forget components such as the coffee and dining table. A coffee table is the ideal storage solution for anything from cosy blankets to books and magazines. Argos have many different storage coffee tables to fit every colour scheme, theme and decor trend. Due to the layout of many modern houses, there is rarely a dining room and instead, a large living room capable of incorporating the two. Rather than taking up a large percentage of floor space with a bulky dining room table, opt for an extending table which can be neatly folded away when not in use – we love the Furniture Village range! Floating shelves continue to grow in popularity due to their versatility and are a fantastic way to open up a room and maximise floor space. The area underneath bedside tables, bookshelves and even desks are valuable space that is wasted, doing nothing but collect dust. Eliminating chunky fixtures will allow you to enjoy just as much shelf space, however, instead just using long, thin platforms that are securely attached to the walls. IKEA even stock floating wall shelves which are equipped with drawers underneath to store away clutter. The best-kept design secret interior decorators use to their advantage is the use of vertical stripes. While you must be somewhat brave to take on utilising stripes in a small room, you would be astonished at how effective the handy hack really is. Also, if you’ve stuck to the neutral colour scheme suggested earlier, then it means that monochromatic stripes will work seamlessly into the clean colour choices. If you’re going to incorporate stripes into a room, you must ensure that they are only used vertically. Vertical stripes create the illusion of height meaning when used on a rug, makes the floor appear longer, and when used on the walls, make the ceiling appear taller. If you’re not yet feeling boisterous enough to add large-scale stripes into your room just yet, then purchasing simply striped pillows, bedding or even lampshades would still make a great impact. Although many assume that small rooms come alongside significantly more drawbacks as opposed to benefits, there are an array of great advantages that make you lucky to have a smaller room in your home. In a larger space, it can be tricky to make an impact, and even the most extravagant of furnishings can become lost. Whereas, in a smaller room, only a few bold statement pieces are required to stand out from the crowd. You will save both time and money searching for unique finishing touches as you will be able to get away with just one or two. Although a neutral colour scheme is best suited to a small room, this doesn’t necessarily mean that it has to be dull. 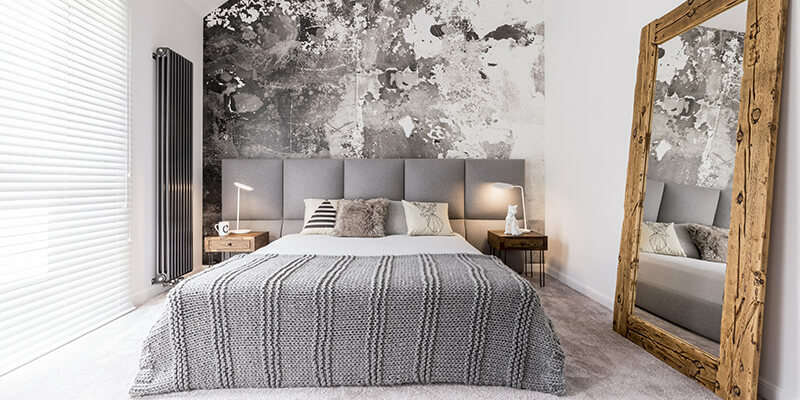 Many different simply designed wallpapers are ideal for bringing a touch of personality into a room and create a focal wall, allowing you to keep the remainder of the room minimalistic. When choosing wallpaper for a smaller room, aim to opt for a design that is filled with large patterns and shapes rather than tiny and intricate designs; this way, you can enjoy a splash of colour without looking too busy. Nowadays, there is even the option to add removable wallpaper to your home, originally created for those who were renting a property, which is only temporary and can easily be removed if you decide to redecorate later on down the line. For more information on temporary wallpaper, head over to freshome. It has been proven that enhancing the amount of natural lighting in your home will create a more spacious and airy feel, therefore, making a room appear bigger. Although it is an incredibly time-consuming and expensive job to add extra windows to your property, there are many alternative ways to maximise natural lighting. If you have a room in your property that includes a door to a garden, conservatory or driveway, for example, then you may want to consider swapping the door for one that features a glass section. A solid door darkens the room and limits the amount of light that is able to seep in, so opting for those fitted with glass panes will be effective. For all other rooms in the home, try to avoid using heavy fabric curtains. Although it is important to ensure that you’re able to conceal your home to the outside world, this doesn’t necessarily mean that you need to fit dark, heavy curtains that will enclose the room. Instead, aim to choose a lighter material such as linen or cotton. Transform Your Small Room Into A Spacious Retreat! Just because a particular room may be small, it doesn’t mean that you are limited in interior design ideas. Smaller rooms are often considerably easier to transform as not only do you have less furniture and storage to worry about, but you can also make an impact using minimal statement pieces. If you’re a beginner to home renovations and feel as if you’d like just that little extra support during the process, then please feel free to contact Clarkson Builders! We hope our article was super helpful in opening you up to a world of new interior design ideas. If so, why not share with your family and friends on social media?